Sentry iron fences Houston TX since 1999. Wrought iron fencing is often regarded as no more than a means of safety and security that could also act as a physical barrier between two properties. But today, these are not the only reasons why wrought iron fence-work and gates are being used around homes. Besides providing safety and security, these fences and gates enhance the overall appeal and aesthetics of the property. Sentry Houston wrought iron gate fabrication & installation. Sentry designs, builds, & repairs automatic iron gates. Iron driveway gate & gate openers sales, service, & repair. Iron commercial & security gate opener repair, service, & installation. WHY SENTRY WROUGHT IRON FENCES? Security of homes is one matter that seems to have most homeowners extremely worried. Iron fence gates are a perfect solution for homeowners looking for enhanced security of their home and property. Plus, integrating the driveway gate with an electric security gate system wherein the gates can be controlled with the help of a code adds another layer of security to your premises. Iron fence gates also add a nice touch of visual appeal to any driveway since they can be painted in any color. It is a good idea to take a look at some of the styles on offer and determine the extent of security cover they will provide before eventually deciding upon a style. At Sentry Garage Door & Gates, we have a wide assortment of iron fence gates from top brands. No matter what your requirements are, we can help you choose the right fence gates for your home. When it comes to the manufacturing of a door, gate, or fence, some of the most commonly used materials include plastic, metal, wood, and wrought iron. But, wrought iron, in particular, provides the right balance of aesthetic and strength, promising the level of security you’ve always wanted. Plus, a carefully chosen and installed wrought iron gate can easily help your home stand out among the rest of the homes in your neighborhood. The performance of a custom wrought iron fence easily surpasses the synthetic or wooden varieties since iron is more durable than others and can be easily molded into any other kind of design that may be desirable. This is the main reason why such lovely artwork is possible on wrought iron fences that give improved value to the property. When done right, a wrought iron fence can prove to be a worthy investment for the long run. Anything and everything that can be made of wrought iron is being used around residential properties to help create a unique artistic look about the place. The best part of it all is that you can come up with a design that matches whatever you have in your mind. It is all up to you and the metalworker who will work with you to put the whole custom iron fence together. Irrespective of the needs for your wrought iron gates and fencing, Sentry garage door, gate, & fence repair offers you the value of long-term experience and expert staff to help get the job done the way you want it done. Our quality workmanship, use of fine materials, professional designs, and competitive prices go a long way towards ensuring our customers get the best return on every penny they invest with us. 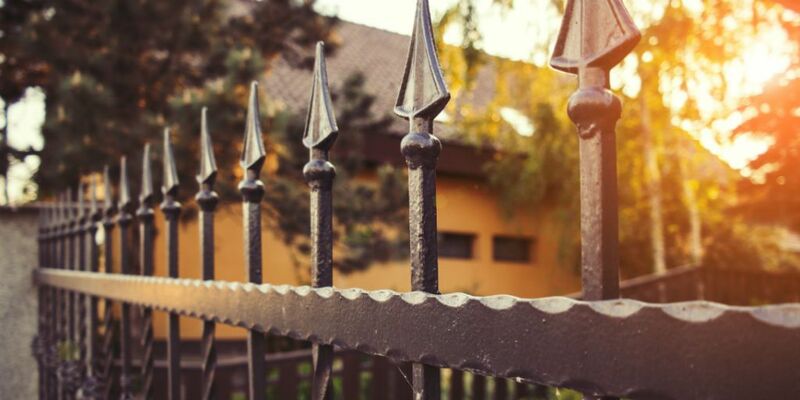 To know more about our iron fences, gate repairs, & what makes us stand apart among all fence companies, give us and speak to one of our iron fences Houston specialists. Also reach out to us for a free estimate on any of our services.